The family lived as tenants at No. 6 Biberacher Straße above the guest house “Zur Germania”. Emil Dworzan also acted as choirmaster of the men's coral society “Concordia”, Laupheim. Among other things he organised a concert in the Catholic social center in aid of free meals for children. His Highness Fürst (Prince) Wilhelm von Urach und Graf (Count) von Württemberg also participated in this as a baritone. The concert was accompanied by the town orchestra under the direction of musical director Laub. According to Mr Rolf Emmerich there still exist 35 historical recordings from services at the Laupheim synagogue from the year 1920. 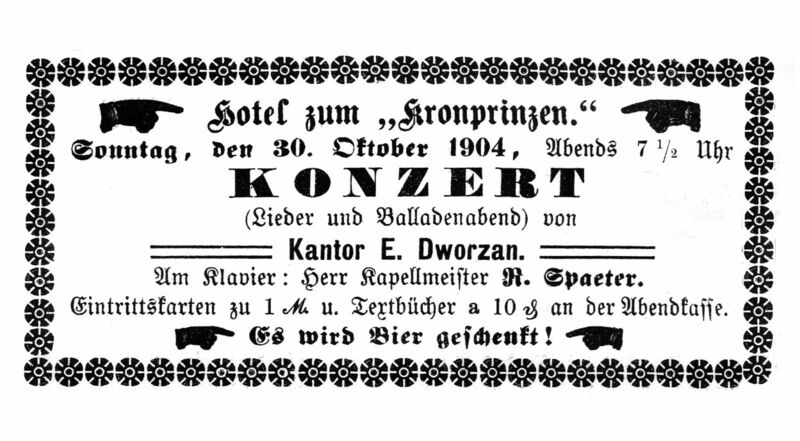 Emil Dworzan also supported young talents. Thus, through him as an intermediary and with the support of the castle estate owner Steiner, a scholarship for choral studies was granted by King Wilhelm II of Württemberg to the young Georg Gut, son of the shoemaker Joseph Gut, a resident of the Judenberg. 4) In August 1923 Emil Dworzan retired from his office as precentor. His successor was Wilhelm Kahn, who was the precentor in Lehrensteinsfeld-Affaltrach. 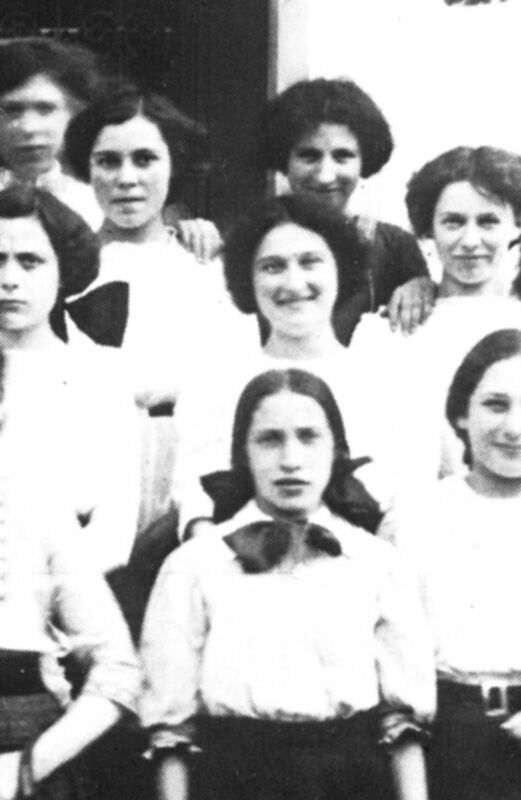 as members of the Sunday “Frauenarbeitsschule” (school for women's occupations) in 1913. (center of picture). 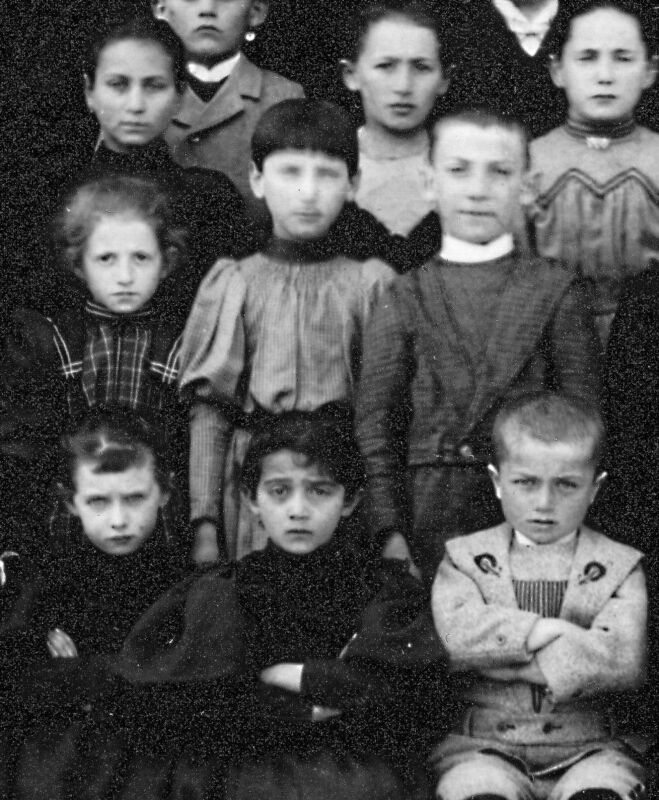 (Photos: J.Braun, Alt-Laupheimer Bilderbogen, K. Neidlinger, 100 Jahre Realschule). Else: born on September 27, 1886 in Posen. She married Kuno Kocherthalter from Madrid in early July 1928, where the family presumably lived at that time. 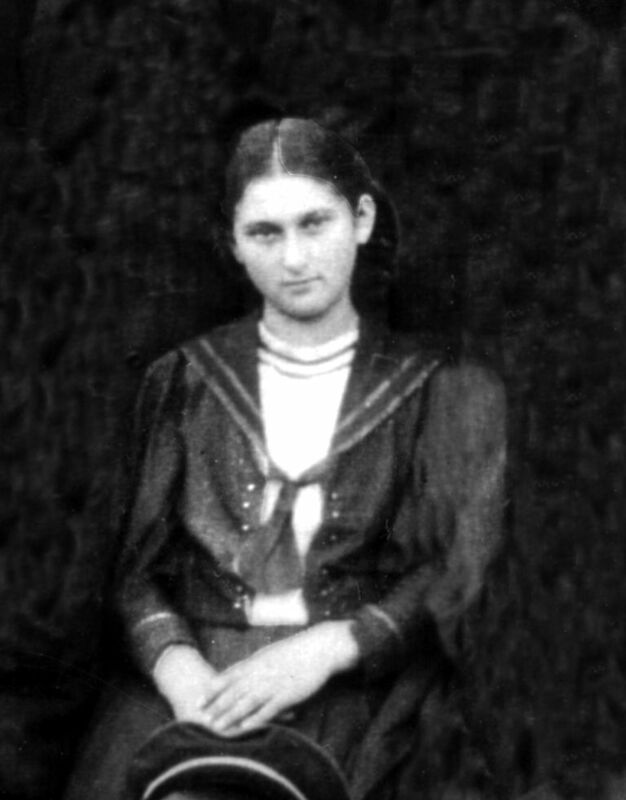 Dorothea, born in Posen on April 9, 1888. Dorothea was single and later lived at 24 König-Wilhelm-Strasse, today the office of the architect Mann. 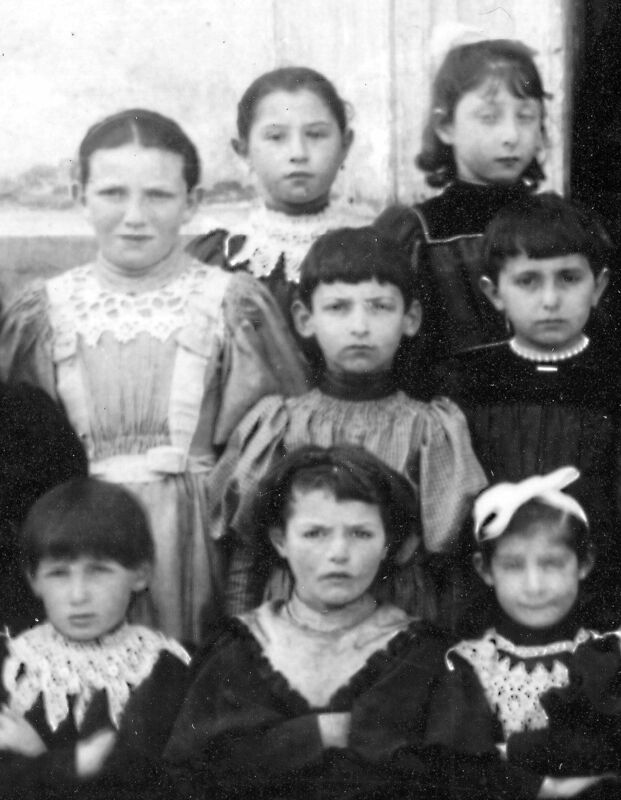 On February 1, 1933 she emigrated to Madrid, probably because her elder sister was already there. Max Jesaias, born on January 25, 1892 in Laupheim, studied in Tübingen and gained his doctorate as Dr. med. in 1921. On December 8, 1924 he married Else Henle in Stuttgart. The wedding ceremony took place at the “Bahnhofsturm” (Station tower). 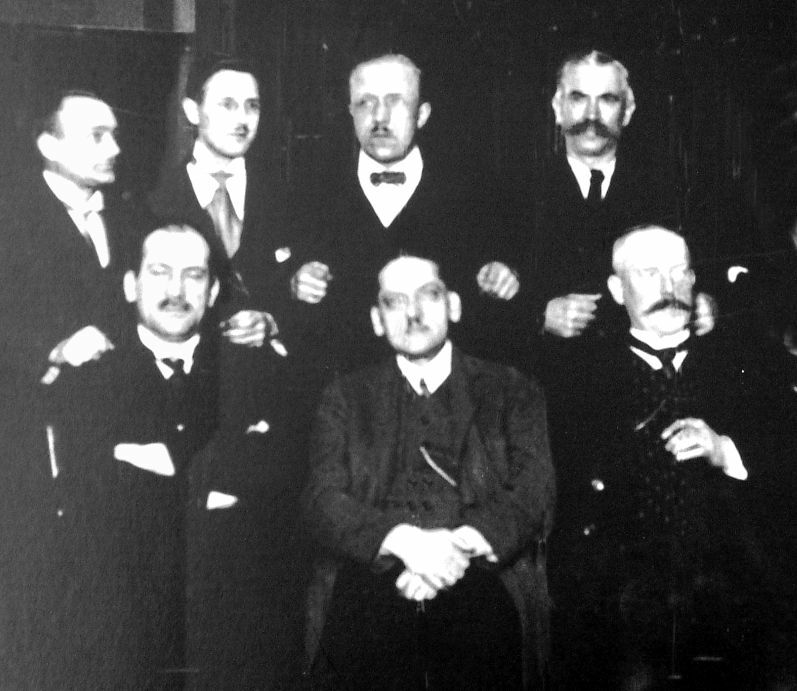 “Following professional training of several years with Dr. E. Krauss (Department for Internal Diseases at the military hospital “Versorgungskrankenhaus” in Stuttgart) and with Geheimrat Prof. Dr. H. Strauss, Berlin, and with Dr. Elsner and Dr. Urg, head of the earlier Boas'schen Klinik in Berlin, I am now a registered specialist for gastroenterology (X-ray labotatory) in Stuttgart." 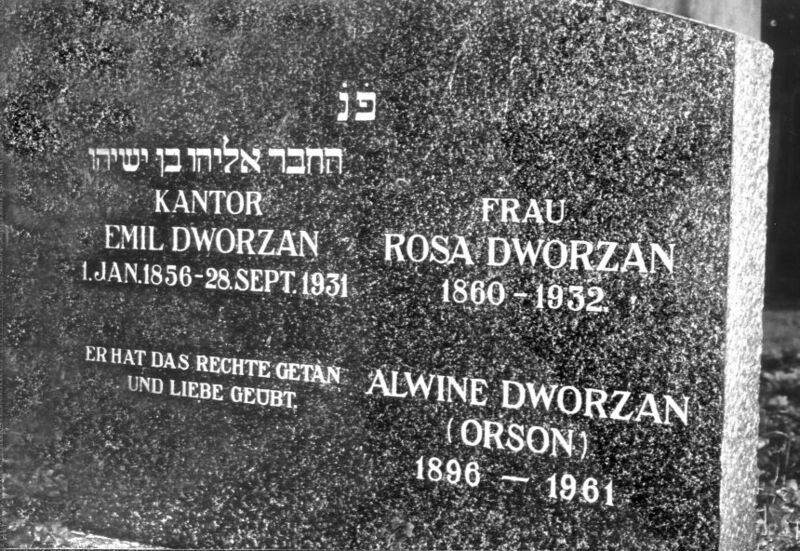 The grave of the Dworzan family with the dedication to the daughter Alwine. 1) Nathanja Hüttenmeister: Der Jüdische Friedhof Laupheim S. 506. 2) GIGW 20/1933, S. 223. 4) Braun: Altlaupheimer Bilderbogen Bd. II S. 177. 7) Nathania Hüttenmeister: Der Jüdische Friedhof Laupheim S. 506.